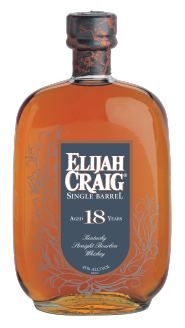 Elijah Craig Small Batch Bourbon. Aged 12 years in new charred oak barrels. Barrels hand selected by the master distiller from choice middle-of-the-rickhouse location. Two double gold medals from the San Francisco World Spirits Competition. "Best of Best" distinction among premium Bourbons in Whiskey Magazine's "Best of Best" tastings. "The aromas have a light touch, offering honey and caramel and cocoa in a straightforward, confident balance. The flavours follow on the palate, with a full, spicy finish that explodes with simple pleasures. Smooth, warm and comfortable, this a sweet sipping Whiskey that's best in a snifter-without ice or water". 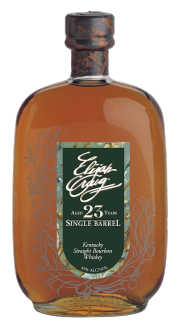 Elijah Craig cask and Elijah Craig 23 year old Bourbon.